Are you fascinated by money and the inner workings of financial markets? Are you someone who thinks in numbers? If so, a career in finance may be perfect for you. The best jobs in finance offer higher-than-average salaries for college graduates, along with the opportunity for career growth. The National Association of Colleges and Employers (NACE) Winter 2019 Salary Survey reports that finance majors can expect to earn an average projected starting salary of $58,464. Entry-level jobs provide a path to lucrative careers in a variety of financial occupations. For some jobs, working as a trainee or assistant prior to taking on the full spectrum of responsibilities may be required. For others, especially candidates with prior work experience or strong internship credentials, you may be hired directly for the position. Review some of the best jobs in finance for college graduates, including salary information and projected employment outlook, along with tips for how to get hired. Accountants maintain financial records and generate reports regarding income, expenses, profits, losses, and tax liabilities. They advise managers about the financial implications of business decisions. Some accountants work for public accounting firms that are contracted by corporations for auditing, tax, and consulting work. Others work directly for corporate and governmental entities. Salary: The Bureau of Labor Statistics (BLS) estimated that the average pay for accountants in May 2017 was $69,350 per year. Job Outlook: The BLS estimated there were about 1,397,700 accounting jobs in the U.S. economy and projected growth of 10% through 2026 – faster than the national average. Actuaries calculate the financial cost of risk in order for companies to estimate the potential impact of various events. They use statistical models, mathematics, and financial theories to conduct analyses. Actuaries work mostly for insurance companies and consulting entities. Salary: Actuaries earned an average salary of $101,560 in May 2017, according to the BLS. Job Outlook: The BLS estimated that there were about 23,600 actuarial jobs in the U.S. and projected a much greater-than-average growth rate of 22% through 2026. Financial analysts provide input to businesses and individuals regarding decisions about investments, such as stocks, bonds, and mutual funds. They analyze companies, industries, and economic trends to help decision makers anticipate financial risks and opportunities. Financial analysts work for investment companies, insurance companies, consulting firms, and other corporate entities. Salary: Financial analysts earned an average of $84,300 in May 2017, according to the BLS. Job Outlook: The BLS estimated that there were about 296,100 financial analyst jobs in the American economy and projected a faster-than-average growth rate of 11% through 2026 for these jobs. Credit analysts investigate the creditworthiness of potential borrowers and estimate the likelihood of default, if loans are issued. Their analyses help banks, credit unions, and credit card companies to set rates and determine loan approvals. Salary: Credit analysts earned an average of $71,290 in May 2017, according to the BLS. Job Outlook: The BLS estimated that about 73,800 credit analysts work in the U.S. and forecasted growth of about 8% through 2026, which is in line with all occupations nationwide. Data analyst jobs are rapidly expanding as big data analysis is applied to many aspects of organizational planning. Data analysts working on financial issues construct and apply higher level data systems. 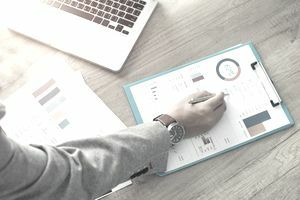 These analyses provide financial input for managers to make decisions about investments, acquisitions, plant expansions, and other new projects. Salary: Glassdoor estimates that data analysts earn an average of $67,377 per year. Job Outlook: Indeed currently has over 6,000 data analyst jobs advertised in their system, with at least 1,099 incorporating some focus on finance. Budget analysts help public and private institutions organize their finances. They prepare budget reports and monitor institutional spending. Budget analysts develop cost estimates for potential future programs or expansions. They also make recommendations for managers, identifying areas of possible budget reductions based on analyzing past underspent budget items. Salary: Budget analysts earned an average of $75,240 in May 2017, according to the BLS. Job Outlook: The BLS estimated that there were 58,400 budget analyst jobs in the country and predicted an increase of about 7% by 2026, which is close to the average for all occupations. Insurance underwriters review client data and actuarial information to make recommendations regarding insurability, rates, and policy structure for potential customers. Underwriters evaluate risk factors involved with prospective client profiles. They must communicate effectively with insurance agents regarding difficult policy decisions. Salary: Insurance underwriters earned an average of $69,760 in May 2017, according to the BLS. Job Outlook: The BLS estimated that there were 104,100 insurance underwriter jobs in the U.S. with a projected decline of 5% through 2026–lower than the average for all occupations. Keep in mind, however, this option is not often considered by new graduates, which lowers the level of competition for interested candidates. Insurance claims adjusters gather information about the circumstances surrounding insurance claims, including interviews with people involved in accidents, obtaining photographs, and the physical inspection of damages. They review policies to determine the level of coverage, estimate repairs, and issue determinations concerning payments to customers. Adjusters negotiate settlements with clients, attorneys, and other insurers. Salary: Insurance claims adjusters earned an average of $64,690 in May 2107, according to the BLS. Job Outlook: The BLS estimates there are 328,700 jobs for insurance adjusters, appraisers, examiners, and investigators with a projected decrease of 1% in these jobs by 2026. Given the low visibility of this option with prospective graduates, competition for vacant positions is relatively low. Compensation and benefits specialists analyze options for providing employee benefits in a company with the goal of maximizing coverage at the lowest possible cost. They evaluate positions, classify jobs, and set standards for salary and wages. Compensation specialists research market rates for salaries to make sure the compensation offered is competitive enough to attract talent. Salary: Compensation and benefits specialists earned an average of $62,680 in May 2017, according to the BLS. Job Outlook: The BLS estimates that there are 84,200 jobs for compensation and benefits specialists with expected growth of 9% by 2026, which is about the average for all occupations. Personal financial advisors evaluate the financial needs of individuals and help them with decisions on investments, tax laws, tax planning, and insurance. Advisors help clients plan for short- and long-term financial goals, such as saving for retirement through investments or other strategies. Many advisors provide tax advice or sell insurance in addition to providing financial advice. Salary: The BLS estimated the average pay for personal financial advisors was $90,640 in May 2017. Job Outlook: The BLS estimated that there were about 271,900 personal financial advisor jobs in the U.S. economy and projected growth of 15% through 2026, which is much faster than the national average. Skills you need Finance professionals in different niches possess a wide variety of skills, including research, analytical, verbal and written communication, persuasive, sales, problem-solving, and technology. These are skills you can hone during internships, summer jobs, volunteer experiences, and extracurricular activities. Top majors companies recruit Employers recruit business and finance majors but also give consideration to liberal arts and science majors, particularly those with internship experience, a strong academic record, and evidence of strong analytical and quantitative skills. Participate in college recruiting programs Employers for finance jobs recruit heavily through college career offices so make sure that you tap into the resources of the career office on your campus. Recruiting often takes place early in the year in which you will graduate so make sure you explore opportunities well in advance of your senior year. Some employers have summer internship programs that could lead to a job offer after graduation. Use the best job sites In addition to using the top general job sites, also utilize the job sites that focus on entry-level jobs for college seniors and recent graduates. Consider a Variety of Job Options If you’re a finance major who isn’t necessarily interested in a traditional job in finance, there are other career paths that are a good fit for finance majors to consider. Don’t feel you need to be locked into a specific role if it doesn’t feel like it’s the best option for this stage of your career. People change jobs an average of 12 times during their career, so there is plenty of time during your early working years to explore a variety of options.